Apple's AirPods look a little funny, but Apple can improve more than just the design. Apple’s AirPods launch wasn’t exactly smooth. A months-long delay led to rumors as to why that delay happened—could it be that the Bluetooth accessory Apple designed as the perfect complement to its headphone jack-free iPhone 7 wasn’t ready for prime time? 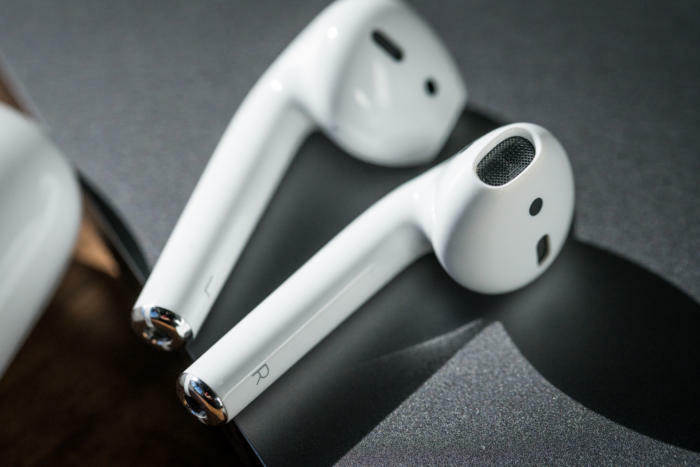 But Apple started shipping AirPods in late December, just before the holidays, and has since captured 26 percent of the wireless headphone market. Apple CEO Tim Cook said the earphones are a “runaway success” and that Apple is making them as fast as possible. I love my AirPods. I wear them to make phone calls, listen to podcasts on the subway, and to listen to my jams while working out both indoors and outside. They fit perfectly and pair seamlessly to my iPhone (and to my MacBook Air and Apple TV). Taking one AirPod out—which pauses whatever I’m listening to in order to better hear subway announcements or talk to a barista—then putting it back in to resume playback, is pretty delightful. The charging case is magical and travels with me wherever I go. AirPods are, to be quite honest, a far better product than I expected. But there are three things I don’t love about the AirPods—three huge areas of improvement that Apple is hopefully working on as we speak. One of the AirPods’ biggest selling points is integration with Siri. With a double tap on one of your pods, Apple’s voice assistant can easily perform a number of tasks for you—at least in theory. In practice, Siri is sloooooow to respond, and not more convenient than just performing the task yourself. For instance, Siri can control your music through the AirPods, but when you ask to turn up the volume (because there are no physical volume controls on either pod), you have to play a waiting game—first for Siri to respond, which pauses your music, then for the volume to increase, then doing the whole process again if Siri’s two-notch volume increase wasn’t enough. Siri needs to become faster and more responsive to be truly useful when it comes to music playback, which is mostly what I use AirPods for. Siri is infinitely more useful in non-music situations, like composing and sending messages I dictate. It’s a shame that Siri is better at texting from my AirPods than music and podcast playback. AirPods could use some physical buttons, or at least another gesture control. Siri’s audio controls leave a lot to be desired, but even if they were amazing, AirPods need more gesture controls. As someone who uses public transit every day, I’m not calling up Siri to skip songs for me every time I want to get to the next track on a packed subway car. That’s just embarrassing. I don’t really expect Apple to add buttons to this super streamlined accessory (though just one would be great), but there is potential to add more gesture response. 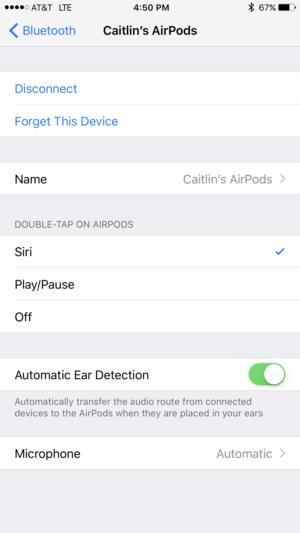 Changing the double-tap function, which can either call up Siri, answer a phone call, or play/pause your music, is definitely convenient (though you have to find and change that functionality in your Bluetooth Settings menu, which isn’t exactly intuitive). But I wish there was at least one more gesture that I could assign a function to, like one tap to skip a song. I’ve mostly given up on Siri’s help with audio and rely on my Apple Watch’s Now Playing controls. 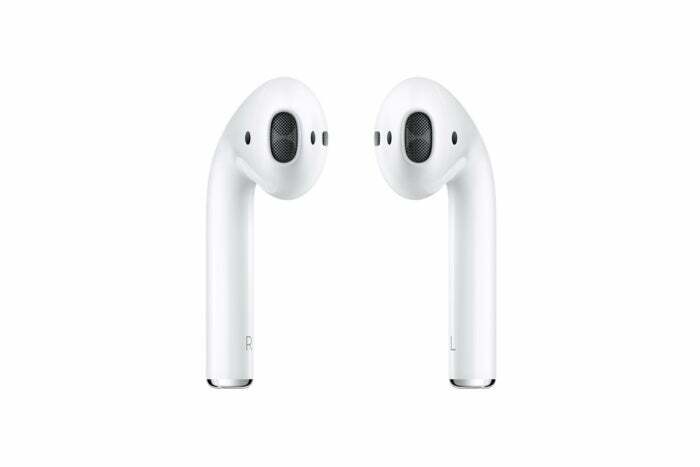 Like the EarPods that Apple includes free with every iPhone, the AirPods are not rated as water-resistant or waterproof. I work out wearing my AirPods, just like I did with my EarPods, but let’s be real: Your ears sweat, and sweat on electronics that aren’t designed to repel water is generally not gonna end well. I wasn’t worried about EarPod sweat, because those earphones are free. Who cares if they short out? But the AirPods are $159, so I’m a little hesitant to recommend them for exercise (despite the fact that they stay in my ears better than some sportier models do). I wish Apple would make a sweatproof AirPods Sport model, perhaps with a heart rate sensor inside, as the company has hinted at in patent applications. One patent even covers AirPod head gesture input, which would be even better than tapping for music playback. The AirPods were just released, so I’m not expecting any major upgrades anytime soon. But this device is already so good that improvements to Siri and gesture control could easily make it a must-have.